The picture doesn’t do it justice. 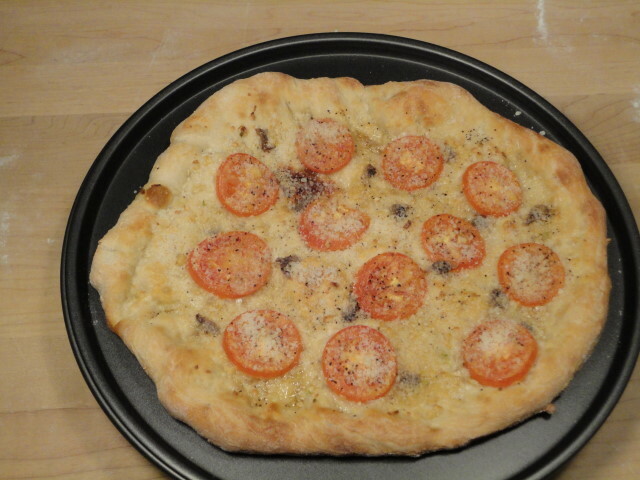 I don’t know what this is called out in the world, but we called it “Homestyle” pizza. 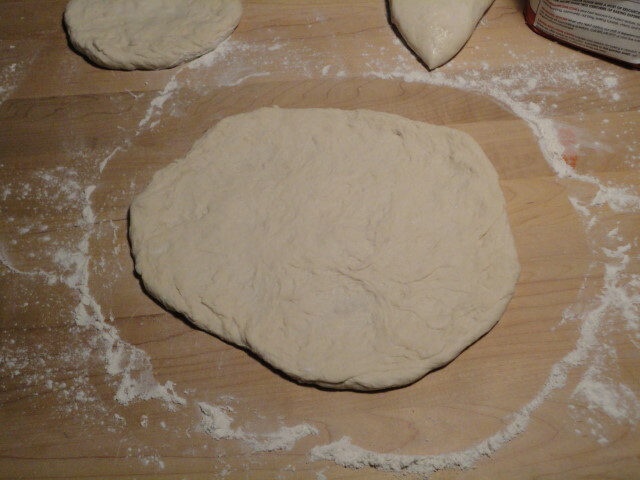 Now to start, have your dough ready to top. I used half of the dough from my pizza dough recipe. It makes a pizza that is approximately twelve inch wide. You may want to place the dough onto a peel or pan of some sort before you start to avoid difficulties later. I didn’t, and barely got it onto my peel. Of course, if you’re baking it on a pan, you can just assemble it on there. Preheat your oven to 450-500° F. The hotter the better, especially if you have a pizza stone. The first step is to swirl on some olive oil. You should use “more than you think you should”. You can adjust this, of course, but the oil is integral to this pizza. 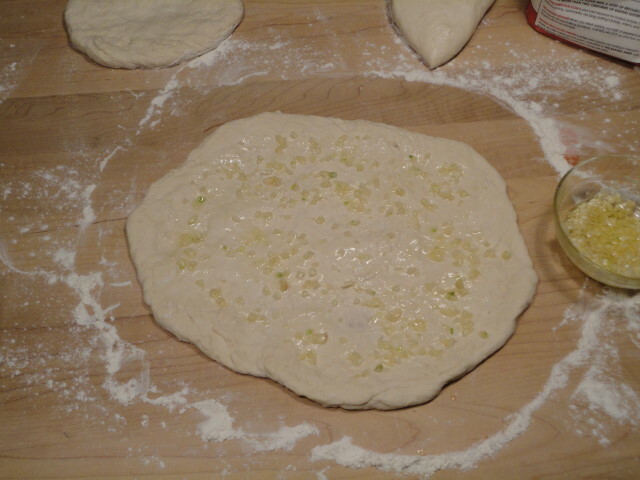 I tend to mix the garlic with some oil and just spread it around on the dough. I told you there was a lot of garlic! You could probably get away with that much oil, but you might want to add a bit more. 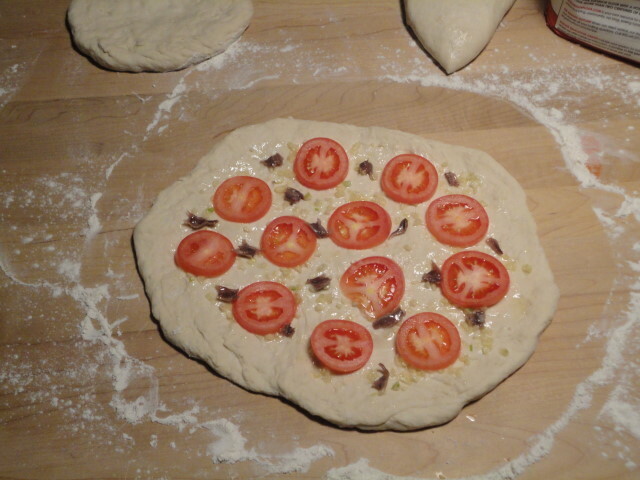 The next step is to add the tomatoes. I cut them into quarter-inch slices. You can place the slices whole or rip them up. Next, add the anchovies. Obviously your taste is going to dictate the size of the pieces, or whether you add them at all. I never liked anchovies until I had this pizza. I tear them into tiny pieces and place them around the dough. Next add a liberal sprinkling of Parmesan cheese, and finish with some black pepper. When the oven is preheated, slide the pizza into the oven and bake it for 10-15 minutes. Keep an eye on it, just in case. 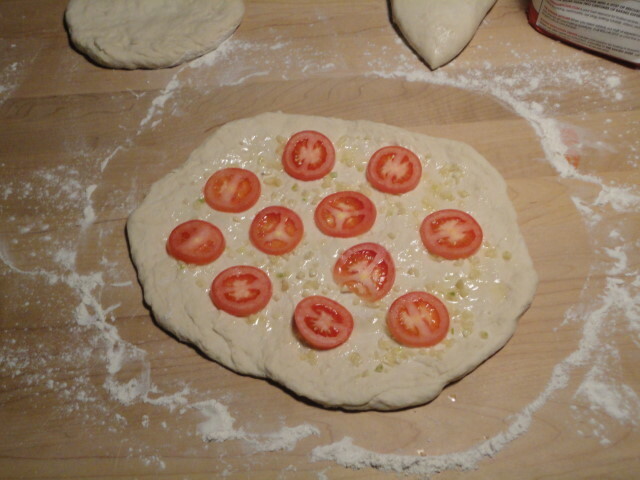 The crust should become a nice golden brown, and the tomatoes should be well-cooked. When it comes out, the bottom is crisp like a cracker. 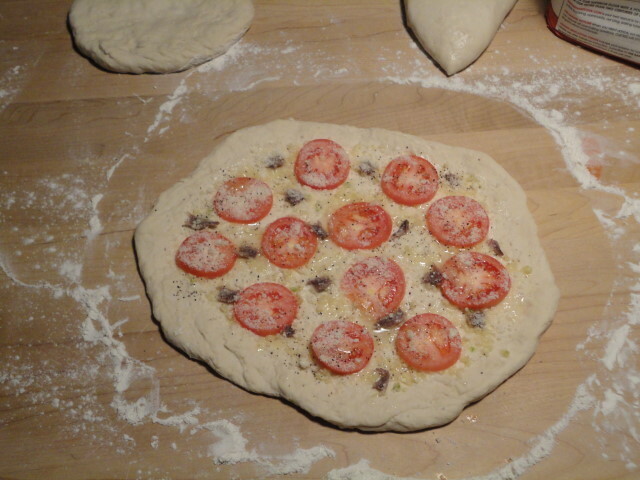 The top is alternately crispy and creamy from the oil and Parmesan cooking into the dough. 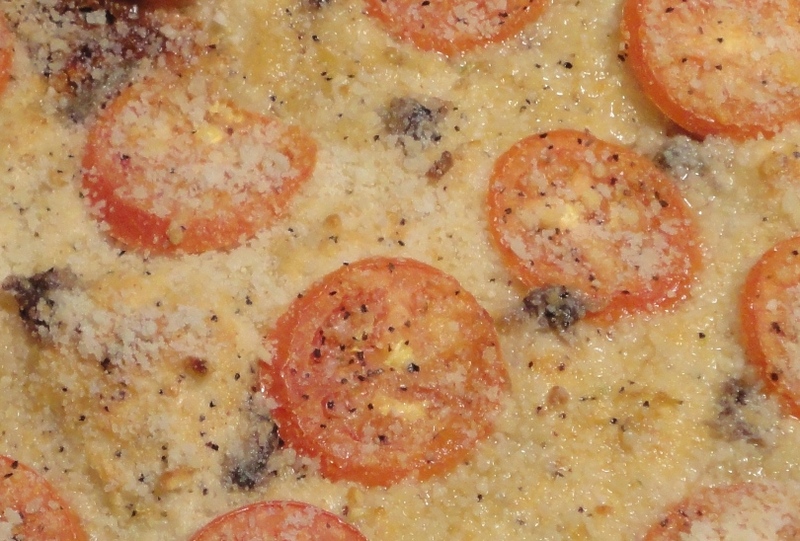 The tomatoes add a nice tang, and the anchovies pop in now and again for a salty hello. I haven’t had this in quite a while, and making it has reminded me that it’s still my favorite. What a great recipe, this looks delicious! Nothing better than homemade pizza 🙂 Great blog you have, so glad to be a new follower! Thanks, welcome to the party! I used to love Sal’s Pizza. It must of been because your were the one making the pizza. Haha, right! Actually, I can’t take away form Sal in that department. He knew his pizza.